The Scarpa Drago is a highly sensitive, supple, and soft climbing shoe for steep technical boulders and demanding overhanging routes. The Drago shares many similarities with Scarpa's other highly aggressive model the Furia, but the Drago features a thicker, more durable outsole that will increase pushing-strength on edges as well as a more flexible and nimble slipper closure system for effortless toe hooking. 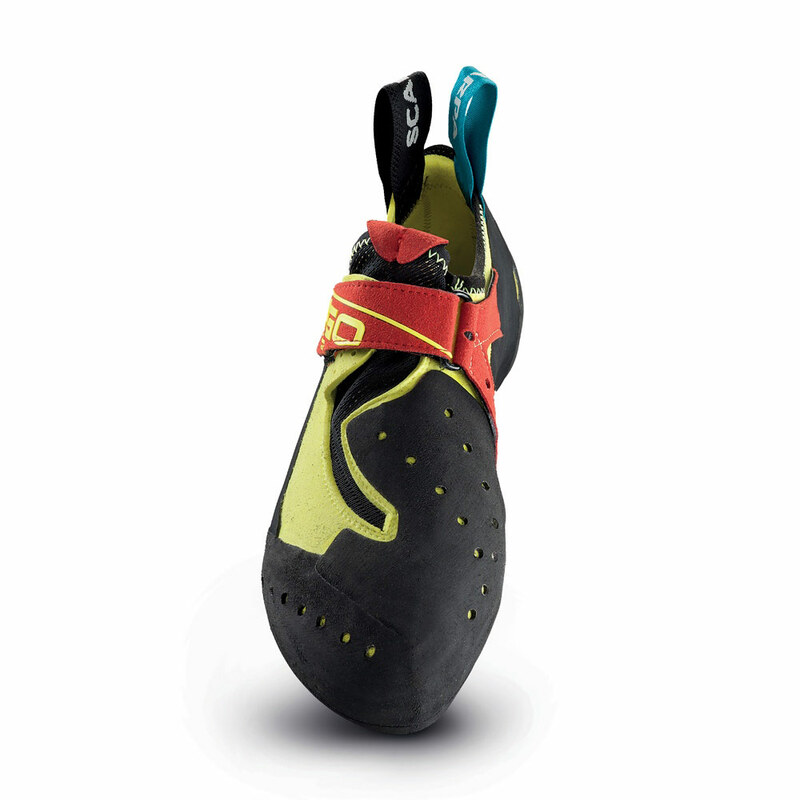 With the high-friction Vibram® XS Grip 2 rubber, the Drago excels on anything steep with microholds and edges, as well as smearing on glassy, polished rock. The Drago features a microsuede upper that will provide next to no stretch, and it should be fitted snugly for a performance fit. The pain is rewarded! It is a hard to break show but when you put it on you feel it is part of you! great feeling and perfect grip on the smallest things on the rocks. Fully recommended! This is my first pair of really soft shoes and what a revelation! Went indoor bouldering with them and first impression is really strange as you can feel everything you step on but once you get used to it the feedback you get is such that you feel all the more confident smearing or stepping on the tiniest hold. As the sole is so soft you can also bend your toes and almost grab a hold or bend them upwards to toehook. Heel feels good but not as great as my Solutions. Size may be the culprit but tried half a size down and my toes were too curled and it somehow spoiled the sensitivity. Rubber feels so thin I fear for it's durability and so i save them for the hardest boulders but so far so good. In any case i am totally addicted and will surely pick up another pair when these wear down. Without a doubt, the best and most comfortable shoe I have used. With a thin sole you feel everything you stand on and with a lot of rubber on your toe it's the best shoe for toe hooks. When it comes to size, I would have gone half or full size down from your usual size. I really love this shoe and use it for indoor bouldering, lead climbing, competitions and on the rocks! It's great for hooking, toe-hooking, yet still comfortable. The only negative about it, is that it's pretty thin leather so it wears down quite quickly. If you use it often, it won't last longer than 4 months... However it's a great shoe and super soft, so totally worth it and on EpicTv it's super affordable as well! The most comfortable climbing shoes ever! First I was a bit sceptical about these shoes, really soft, expensive,... when I tried a pair of my friend I couldn't believe myself, I felt super comfortable and got feeling that I could step precise specially on flat holds, heel and toe hooking. Even though the price is high, it's worth it for performance you will get! It smears to everything, sticking to the rock fantastically, at the beginning was quite difficult to take the footholds with the peak beacuse I never had so asymmetric shoes, but once you start to understand...wow. Excellent heel, likewise fitting, even if the peak is not the most powerful hook it makes feel enough confident to try movements you never tried. I used to rock a pair of Solutions (39.5) but I always felt I was a bit too light (66 kg) to be able to smear with them properly. Hence I wanted to get something softer and the Drago (size 41) fit that criteria, and now my smearing is impeccable . Besides the softness, they fit my feet really well, I had some hot spots out of the box, although they were gone after 3 sessions or so. The only thing I can complain about is that I got really tired in my feet the first few sessions, however I knew that was too be expected. Now my feet are stronger and I feel like I've become a better climber because of it. Ein wirklich sehr guter Kletterschuh, den man am Anfang aber etwas einklettern muss. Es braucht etwas Zeit, bis sich das Leder richtig an den Fuß angepasst hat. Dann sitzt er aber wie angegossen. Der Schuh ist sehr weich und deshalb gut geeignet für Personen, die ein geringes Körpergewicht haben. Eignet sich bestens zum Bouldern und auch Sportklettern! Probably the best shoes I´ve ever had for steep bouldering and gym climbing. Really soft, not for beginners. Super soft climbing shoes. Perfect for bouldering. Purchased a pair of 41 Dragos to replace 40 a pair of La Sportiva Solutions. So far I am very impressed. The vibram rubber gives confidence straight out of the box and the fit is very snug. Compared to previous high performance shoes, these wore in after a few hours. The extended rubber over the toe box gives plenty of grip for toe hooking and the heel is snug and supportive for hooking, even compared to the S-heel on Sportiva shoes. I have currently used them indoors for both bouldering and steep sport climbing and they have held up well in both situations. I have climbed with different Scarpa shoes for several years now. I have been using the Boosters and Furias before the Drago came out. The Drago is a significant improvement on the toe hooking capability of the Furia which was the biggest drawback on that shoe. Otherwise they climb in a very similar manner. The fit is very snug and the soft rubber provides excellent grip. Of course this comes at the cost of relatively fast wear for the soles. I climb these shoes for one month now. The size is very equal to my scarpa shoes before which where Instinct VS and Vapor V. My normal shoe size is 42,5, my Scarpa shoes are all in 41. The shoe itself has a very tight fit, it almost feels like a sock. The toe box has moulded spots for every toe which makes it more comfortable. The rubber is very soft and has a great friction. Same goes with the toe hook area which makes this shoe a toe hook weapon. Heel hooks feel very solid. No air between the shoe and my heel. The velcro gives a good support in addition. This is definitely the best shoe I've climbed, followed by the Instinct VS. Climbing in the roof felt good with the shoe. Very small footholds are a little problematic since the shoe does't give you great stability for the whole foot. So it might feels tiring and unstable. The durability of the rubber won't be super good. It's not really a con since all soft rubbers have this issue. Cheers and thank you Scarpa! Sizing: Ordered in size 39EU - for very snug fit. Similar fit in La Sportiva shoes (Solution\Futura - 38, Python - 37.5). Street size 41-41.5 (medium\narrow foot). Pros: Very snug fit, no dead space anywhere inside the shoe. Quite comfortable after 10-20 mins breaking in. Soft shoes for steep problems, yet edge surprisingly good. I bought those in size 42 whilst my street shoe size is 42.5, as I wanted a comfortable shoe for training that was still performing well. Initially I thought they were too big as I've always been used to wearing tight shoes, but I've now climbed in those for 6-7 sessions and they haven't stretched at all, so whilst they remain very comfortable they are still very precise. The toe is very sensitive and the heel is pretty good (feels better than the Furias but probably not as good as the one of the Solutions). Overall I am very satisfied so far and I am really thinking not to purchase tight shoes anymore - unless you really need something extremely technical for vertical walls with micro-edges. 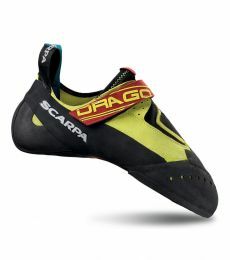 The Scarpa Drago is unequivocally now my favourite pair of performance climbing shoes. Now on my second pair, they are my go to pair of shoes for competitions. My first pair were sized a bit too big and so heel hooks were a bit touch and go; however, I still found the grip and sensitivity of those shoes incredible. Having now downsized to a more appropriate fit, I am blown away by these shoes: fitted well, the heel on the Drago is soft and sticks to most heel hooks, the toebox is fitted snugly (although this is dependent on footshape I guess), the enormous rubber coverage allows for great toe hooks, and the rand provides incredible tension and support. Equally at home on rock as on plastic, the Drago will simply stck on any hold no matter how tiny, and when it comes to edging I have found them unrivalled by any other shoe I’ve tried. But I truly the Drago is really in its element when it comes to competition climbing; the softness and sensitivity allow you to smear on the most delicate of slabs or negotiate the most awkward of volumes, while the tension rand gives the support and tension to tackle more overhanging and roof-based problems. Heinz Mariacher’s new creation is truly a magnificent pair of shoes and the Drago would be an outstanding addition to anyone’s climbing shoe quiver. I am used to La Sportiva's no edge shoes, which I still use on slabs and small holds. I thought they were the best shoes out there, but kept looking for a better shoe for toe- and heelhooking. The Drago is perfekt for both. Much softer and with a very snug fit! I haven't bought them as small as my Speedsters, so this probably also made them more comfortable, but they are without a doubt the most comfortable shoes I have ever had. And last but not least, on volumes the friction is way better!! 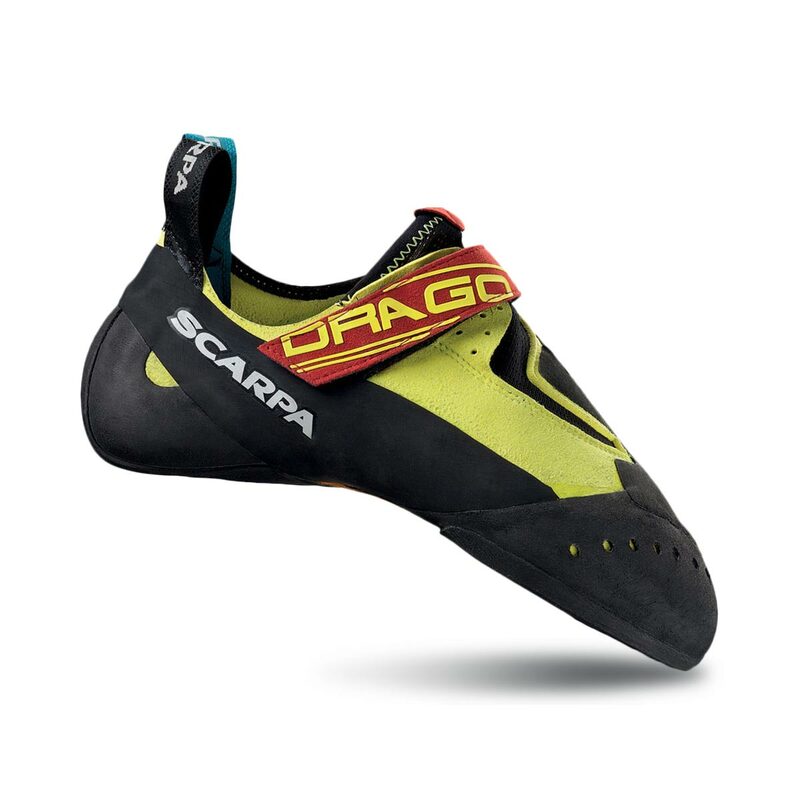 The Drago is a good companion and very comparable to the Scarpa Furia. I use them both and mix and match and switch between those two currently. Features the same last, but with only one velcro and instead more toe rubber, the shoe feels like a bit softer and even more comfy twin of the Furia. The only real difference, besides maybe slightly the overall stiffness, between those two is the heel construction, which in my personal opinion works even better here on the Drago then the one of the Furia. They are very comparable to the Five-Ten Team and Team VXI shoes, in fact the stiffness might be somewhere between those two, but in my opinion with much more precise hooking and also edging power plus more comfort. This might depend on your foot, but they are slightly wider and a bit more asymetric. If you prefer your shoes soft and super sensible for toe grabbing power like i do, then go for it and give them a try, you might be blown away! The Scarpa drago is a very aggressive down turned shoe in the Scarpa range. It is also very soft compared to the Instinct VS, and similar to the Furia. The zig zag opening allows my feet to be slipped on easily and the top strap is able to secure my feet in properly. The heel is the same as the Instinct VS, which is really fitting and tight. One thing i really like about this shoe is the fact that the rubber covers the entire top of the toe, which is great for toe hooking! One thing I would advise climbers would be that this has a high volume, in other words, this is very different from the La Sportiva Women's Solution in terms of fit. So if you have a low volume foot, then i could not recommend this shoe. For sizing, would recommend downsizing, but appropiately. I wear a street size of UK7 but wear UK5 for this, which gives it a really snug fit. The drago is a very soft climbing shoe, it is actually the softest shoe I own, having owned such shoes as La Sportiva Python and Genius. 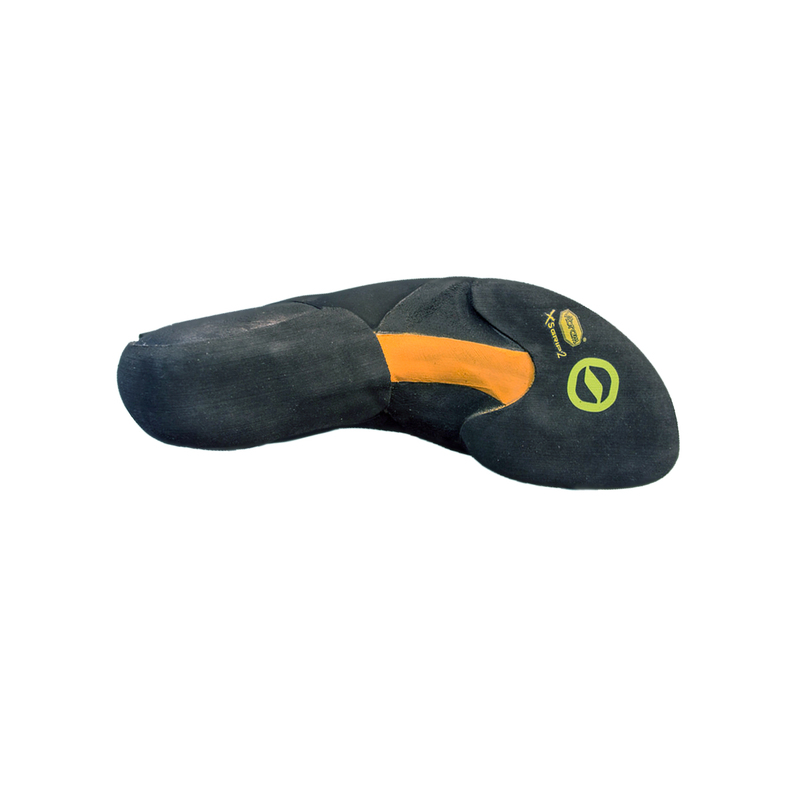 With no midsole it has perfect smearing abilities on slopers and volumes, so I would recommend it for bouldering, as it might be too soft for most people climbing. But If you are a lightweight climber (<70kg) you can also take full advantage of the Drago during climbing, preferably steep climbing. The features I like the most about the drago in addition to the feel is the heel and the extended rubber coverage. Some words to the fit: it has a very narrow toebox which is perfect for small to medium feet with a long big toe. A word about sizing, I wear 39 La Sportivas and 40 in Scarpa Booster S, 40.5 in Vapor Lace. The Drago should be 40.5, as it needs a little bit looser fit and is super comfortable. If you size these shoes too tight you will get premature wear spots on the side of the rubber rands, as the rubber bulges out. Be extra careful with sizing here! If the shoe feels tight in the shop, size one half size up. It should be snug but not too snug like other shoes.